Last year, the very first PSA Volunteer Vacation sold out within 2 hours of opening registration. Those lucky participants experienced a fantastic week in the backcountry, hard physical work, and the ultimate satisfaction of giving back to Philmont. Your Philmont Staff Association and Philmont Scout Ranch are pleased to again offer this opportunity in 2017. The dates are September 16 to 23, 2017. The cost is still only $210. Registration deadline is August 15th, 2017. Please see the Registration and Cancellation Policies at the end of this article. The work in 2017 will continue what was started last year. 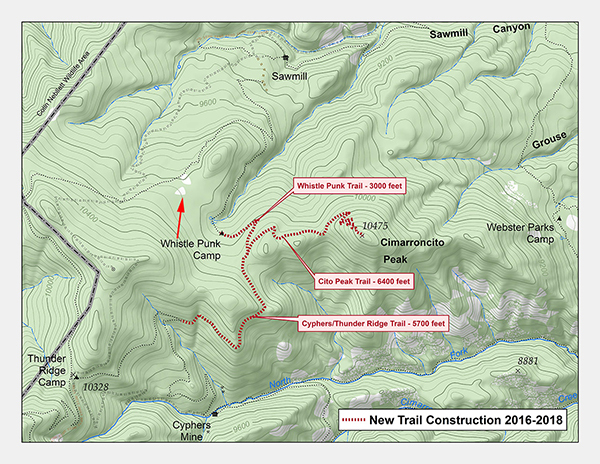 Volunteers will proceed with the construction of a new spur trail off the Sawmill and Thunder Ridge trail connecting the new Whistle Punk trail camp to the top of Cimarroncito Peak. Eventually this trail will go to Cypher’s Mine, providing a route through a seldom used part of Philmont. There has never been a trail to Cito Peak. Your work will be instrumental in making this happen. The entire 2017 Volunteer Vacation program will be very similar to 2016’s, but only better, based on the feedback received from the first-year participants. If you missed the recent summary article in the December High Country magazine, you can read it here. This program is available to PSA members and their eligible family members. The minimum age is 16 years by date of participation. Trek-eligible family members include your spouse, child or stepchild, sibling, parent, grandparent, grandchild, niece, nephew or in-law of the PSA member. Please do not register anyone who does not meet these requirements. If females under the age of 21 years are registered, we will attempt to make accommodation for Youth Protection requirements. If we cannot meet Youth Protection requirements (having a female over 21 participate) we will return the entire registration fee. The full Philmont medical form will be required – the same seven-page form required for Trekkers. Please note, just because your doctor certifies you, it does not mean this program is for you. Volunteer Vacation requires hard work, long hours, a good crew spirit, backpacking ability and a sense of humor. This program is not leisurely and is not for those who are afraid of sore muscles, getting dirty, and who cannot maintain a great attitude when the going gets tough. The PSA reserves the right to return the entire registration fee of any person who would be inappropriate for this program. Arrive at Philmont during the day. First meal will be dinner in the PTC Dining Hall. In the evening, the Conservation Department will begin the program with introductions and specific plans, gear and packing advice, and general Q&A. Breakfast at PTC and then depart for the drop-off point just above Sawmill. Next, a short hike to Whistle Punk trail camp, set up camp, and have lunch. Following lunch, you will receive Philmont tools and trail construction instruction, start trail construction work, and have fun. Trail construction work (and more fun). There should be time to climb Cito Peak! Finish uncompleted trail construction work, break camp, clean-up the Whistle Punk campsite, and then hike to another campsite of the crew’s choosing to spend the night – rest and relaxation via traditional backpacking. In the morning, hike to the pick-up point and return to Base Camp. You’ll have the option of climbing the Tooth of Time or just relaxing. Friday evening’s dinner will be a celebration of the week and recognition for what you have given back to Philmont. Participants will be awarded the coveted Volunteer Vacation patch. Depart Philmont after breakfast. Take a proud and satisfying look back at Cimarroncito Peak (and the Tooth, of course)! Both trail food and large quantities of FRESH food to insure sufficient calories. This will be a much better menu than the standard trail food menu. Cooking, cleanup, and water crews will be established. Will we need to carry a full back pack? Yes & No. Philmont will pre-stage food, tools, and all crew equipment at Whistle Punk. However, the unused room in your pack will need to be filled with extra (and heavier) work clothes along with warm clothes (jackets, gloves, long underwear, headgear, etc). Extra gear can be shipped back to Base Camp after trail work is completed, but you will then be carrying traditional crew gear and food when hiking to your campsite on Thursday. Probably. Whistle Punk is almost 10,000 feet, and by September 16th, Autumn will be setting in. You will need warm clothes and a warm sleeping bag. Whistle Punk is located south, and uphill, of the trail from Sawmill to Thunder Ridge. There is a spring nearby. This camp was first used in 2016. What does Whistle Punk mean? A Whistle Punk is the lumberjack who operated the signal wire running to a donkey engine whistle. The camp was given this name because it is near an old logging camp. What happens if twenty persons register before me? We will put you on a wait list. We did have several cancellations last year. Available slots (see below) will be filled in the order that registrations are received. The preferred method of registration is electronic at https://www.philstaff.org/. The slots will be filled according to the date and time an electronic registration is received. If registering by mail, the date and time of receipt by the PSA office. If you call in your credit card information, the date and time of that call. Postmarks or dial-in registrations prior to the opening date and time (see below) will not be accepted. 2019 Volunteer Vacation registration opens at noon Mountain Time on March 1, 2019. 24 slots will be available upon opening. Registration deadline: August 15, 2019.